Published in The Energy Collective (December 28, 2017). 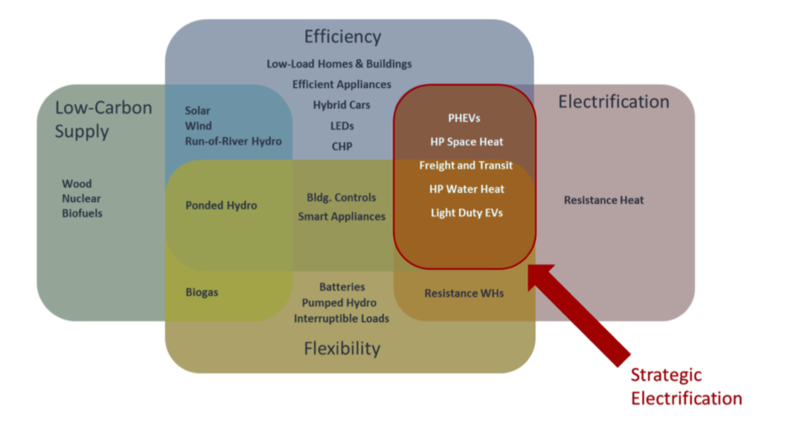 This is Part 3 in a three-part series on electrification in the built environment. Read Part 1 and Part 2. Canada has focused its efforts on reducing carbon pollution from the electricity grid and improving energy efficiency. However, these actions alone won’t be sufficient to transition to a low-carbon economy, and in many jurisdictions, will only reduce greenhouse gas emissions by half the amount required by 2050. The rest of our emissions reductions will rely heavily on “strategic electrification” of heating and transportation — defined as the powering of end-uses with electricity instead of fossil fuels, in ways that reduce pollution and increase efficiency while lowering costs to consumers and society. There are several barriers to electrification that must be addressed by suppliers, contractors, and policymakers in order to encourage widespread adoption. Electric heat pumps are currently a small part of the market in Canada — and this means higher upfront costs. More work must be done to educate consumers and installers on the many benefits of these devices (did you know that a heat pump can provide air conditioning as well as heating? ), and make them more available as standard products. For example, up to 70 per cent of water heater replacements are done at the time of failure, making it critical that heat pump water heaters be readily available on a contractor’s truck. Government and utility policies also need to change, as most programs that encourage energy efficiency don’t offer incentives or rebates for those switching from fossil fuels to electric heating. Manufacturers have been working hard to improve heat pumps for the Canadian market, and groups like Northeast Energy Efficiency Partnerships are now working with suppliers to ensure that new heat pump models meet performance specifications designed for cold climates. This should lead to heat pumps being viewed as reliable as gas furnaces, rather than as niche or unproven products. New products are allowing heat pumps to be used in more and more places. For instance, there are air-to-water systems that can be used to replace natural gas hydronic heating in apartment buildings, taking advantage of existing radiators and piping. While these new technologies are promising, they are still relatively unknown in Canada and will need more time and maturity in the market before they are considered as often as more traditional options. We know that modern electric heating technology is going through the early stages of a market transformation, and spurring early adoption through incentives can support this shift. Governments should focus on supporting widespread electrification of new buildings — for example, by using revenues from carbon taxes to subsidize heat pumps in new housing developments. After these early actions, we can allow the supply chain for products like heat pumps and grid-connected appliances to mature and costs to come down, leading to more widespread adoption. During this time, governments should signal their intention to require that new heating appliances be carbon pollution–free. Indeed, in order to meet legislated targets, this kind of regulation must be implemented within the next 10 years. For example, the Pembina Institute estimates that meeting British Columbia’s overall emissions reduction goals will require a 60 per cent carbon reduction in existing buildings. Achieving these kinds of cuts through efficiency alone would require very deep retrofits of all buildings, which would likely be more complex, invasive, and expensive than requiring buildings to electrify. Even so, driving retrofits and efficiency through policy must remain a priority for governments, in order to avoid overburdening electricity supply and capacity as more of the economy electrifies. In the face of the changing climate, governments will need to address the costs and liabilities that might result from Canada’s building sector being unprepared for extreme weather, droughts, floods, and disruptions to the energy system. We know that electrification alone will only solve part of the problem; buildings will also need to be more resilient. Fortunately, many of the most effective approaches to increasing energy efficiency in buildings — better insulation, airtightness, and weatherproofing — also dramatically improve the climate resiliency of these buildings. Such measures can be taken alongside electrification, which will help to lower energy costs for consumers, particularly those who switch from natural gas to electricity. As we’ve seen in this three-part series, electrification in the built environment is about much more than heat pumps, water heaters, and electric vehicles. It is a key tool in Canada’s transition to a low-carbon economy and will be a cornerstone of decarbonizing our economy by 2050. But electrification will also bring benefits beyond emissions reductions. It is a reimagining of infrastructure and mobility planning. It is a part of a sustainable community model for the future that supports the integration of renewable energy, provides affordable and safe heating for all, increases climate resilience, and takes advantage of job creation in Canada’s emerging low-carbon economy. This article originally appeared on The Energy Collective on December 28, 2017.